Let me start off by saying that I cried, dozens of times, reading this book. It was utterly heartbreaking. 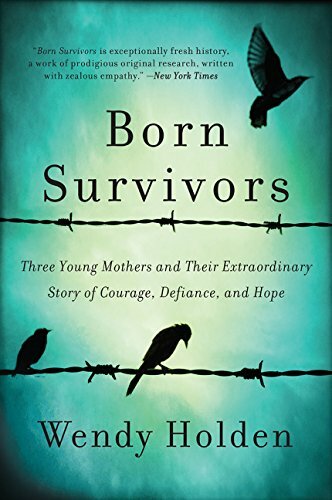 This memoir follows three young Jewish women in Europe during the rise of the Nazi party until the end of WWII and the liberation of the concentration camps. The reader is given a glimpse into each woman’s upbringing including a look into her life; likes, hobbies, families, loves. As the war intensifies, the women find their once idyllic and independent lives, slowly leached of not only property and belongings, but liberties, freedoms, and basic human dignity. While this is the unfortunate, heart wrenching story of countless Jewish peoples during the time period, these women have something quite unique about their stories. Each woman was newly pregnant at the time of their incarceration in a concentration camp, and against all odds, not only did they live to be liberated by the Americans, but their children, born into the desolate, hopeless camps, survived as well. Wendy Holden does such a wonderful job of sharing these brave women’s stories. I felt I knew them each, deeply when I finished the book. I wept for them, I silently prayed for them even knowing how their stories would end up, I felt them on such an emotional level. One of the things which really struck me about each of these women was the unimaginable resilience they each possessed. Losing their child, or death, was never an option. They fought each an every day, each and every minute even, to stay alive. Even in a place as bleak and hopeless as a ghetto, isolated and starving, scared and beaten for minor infractions; people cobbled together beautiful works of art in the form of plays, musicals, and performances. Friendships blossomed, and even love took root. It was moving and profound to read. Overall I cannot speak highly enough about this book. As a mother, it spoke to me in a way that it will forever be branded in my mind, and I will always been amazed at these three women and the incredible fortitude they displayed at what is arguably one of the worst, most horrific genocides of modern time. Until next week my bookish friends.